SINGAPORE COMICS & COLLECTIBLES: WOLVERINE ANNUAL #1 Vol. 5 (2014) One Month To Die! WOLVERINE ANNUAL #1 Vol. 5 (2014) One Month To Die! • PLOT SUMMARY: ONE MONTH TO DIE! A little Father/Adoptive Daughter/Adoptive Daughter's son time. Now that's a mouthful. 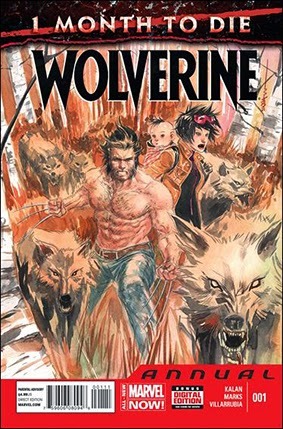 Wolverine and Jubilee take Shogo on a camping trip. Hey, it's a Wolverine story in the middle of the wilderness. What could go wrong? Written by Elliott Kalan. Art by Jonathan Marks. Cover by Dustin Nguyen.